Called a race car in luxury clothing, the aston martin db4gt was a two-seat version of the db4 coupe. It had a big six-cylinder engine that was made even more powerful by high-lift camshafts, larger valves and a higher compression ratio. Only 75 gt road cars were turned out. A few more were specially made for use by racing teams, and there were 19 even-faster ones produced by zagato plus another one made by bertone. No rear seats the db4gt wheelbase was reduced to 93 in. From the db4s 98 in. By shortening the doors and eliminating the occasional rear seats. The front end was more rounded, the roofline was lower and the headlights w7ere recessed into the fenders and covered by plexiglass. Light magnesium-alloy body panels were placed over the tubular frame. exceptional acceleration the twin-overhead-camshaft 3.7-litre engine originally designed by tadek marek now surpassed 300 hp. And with the shorter, lighter body made this model suitable for gt racing. It accelerated from a standing start to 60 mph in just over six seconds. Driven by stirling moss, a prototype won in its first effort, the 1959 silverstone event. In 1961 and 1962, db4gts contested a dozen sports-car races. 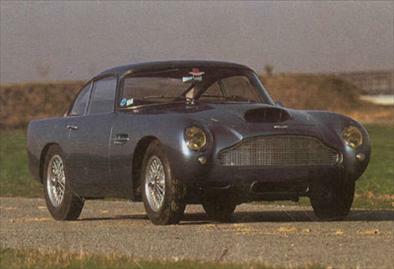 This aston martin db4gt coupe was one of only 75 such road cms produced.